Green hydro plant joins national gridThe nation's very first ‘green' hydro power plant was officially put into operation yesterday in northern mountain Tuyen Quang Province. The Industrial Production Index (IPI) saw a year-on-year increase of 6.8 per cent in the first two months of this year, according to the General Statistics Office (GSO). The three State-owned giants in the energy sector have inked a strategic co-operation agreement with the aim of ensuring national energy security. 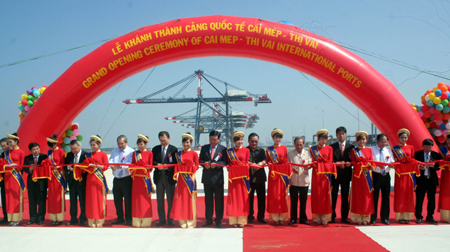 The Ministry of Transport yesterday opened Cai Mep Thi Vai International Port in the southern province of Ba Ria-Vung Tau, which is designed to meet the increasing demand of container shipping. 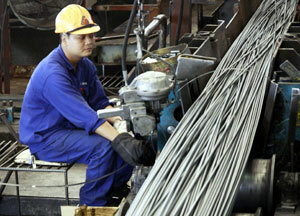 The Viet Nam Steel Corporation is hastening construction its new plant in northern Lao Cai Province as well as the second phase of its Thai Nguyen Iron and Steel Co expansion project. Japan-based Sumitomo Corporation has applied for an investment licence to build a coal-fired thermoelectric plant in the central province of Khanh Hoa, which would become the largest of its kind in Viet Nam. 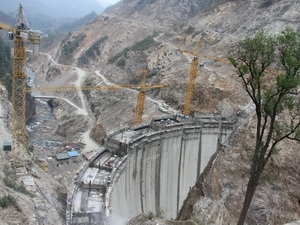 The first turbine of the Nam Chien 1 Hydroelectric Plant in Muong La District in the northern mountainous province of Son La started generating power at 6pm yesterday. Mobilising capital and management experiences from the private sector is a decisive factor for infrastructure development in Viet Nam, especially transport, says Deputy Transport Minister Truong Tan Vien. 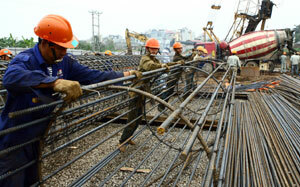 Workers pour concrete at the groundbreaking ceremony of the Distribution Efficiency Project. 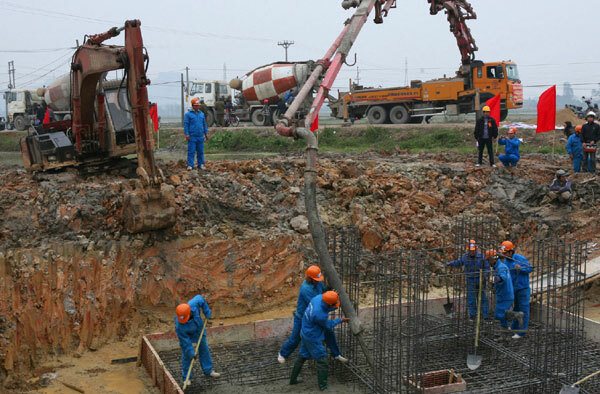 The project, extending through 19 provinces and cities in the northern region, has received financing worth VND4.2 trillion (US$201 million) through the World Bank. The two-phase project aims to improve electricity distribution networks throughout Viet Nam and is expected to be completed in 2017.